Notes: Based on the manga by Karino Takatsu, who is best known for penning the Working!! manga. The "X" in the title is silent per Japanese convention, and as such, the title is pronounced "Servant Service." While the series was airing, a short quiz appeared at the end of each episode, in which the characters posed some question or another related to the show's content (sometimes of a humorous nature) and announced that the answer would be posted on the official website. Having visited said website, I cannot find the answers posted anywhere, indicating that this was either entirely facetious or that the answers were taken down after airing. Since the version I saw was crunchyroll's simulcast, it is unclear whether these segments are also present in the DVD version. 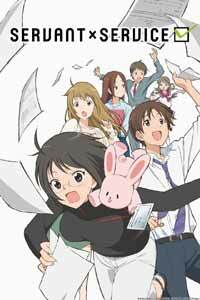 This gag-centric series follows the lives of several government workers employed at an office in the fictional town of Mitsuba, Hokkaido. "Lucy" Yamagami, whose bizarrely long name incited her to join the agency in hopes of discovering the agent who allowed it to be given, perpetual slacker Yutaka Hasebe, and the politely timid Saya Miyoshi all arrive for their first day of work in Episode 1, only to be greeted by a far wackier office than one would expect from the lucrative but unglamorous reputation of this job. Since 2005, Karino Takatsu's Working, a story about a quirky group of restaurant employees, has been one of the more popular four-panel manga series in Japan. The same author's Servant X Sevice attempts something similar: to create a series of humorous sketches about the antics of unusual people all working in the same boring profession, in this case that of a Civil Servant. Given that this is truly very far from the most interesting job in the world, one that is rarely if ever romanticized, this series had a hefty challenge ahead of it, and I will give it points for attempting to tackle that challenge. It's a shame, then, that Sevant X Service never successfully transcends the limitations placed on it by the mundane nature of its setting. Although to some extent the concept of Servant X Service resembles the idea behind the once-ubiquitous sarariman manga that lampooned the conditions of the workplace, the Civil Service office shown here is not an especially bad place to work, and the humor has less to do with the workplace itself than the bizarre events that occur within it (and that would never occur in real life). Rarely choosing to satirize, the series instead relies on wordplay as a source of humor, in addition to recurring gags such as the rabbit-shaped robotic body used by the office's agoraphobic section manager and the repeated embarrassment caused by "Lucy's" long and ungainly real name. Indeed, we also wander into the characters' personal lives as a source of amusement often enough that the choice of setting, by series' end, has become somewhat irrelevant, a fairly common feature of such gag-oriented series. I have had a mixed experience with this kind of show, and in my opinion, Servant X Service is not quite witty enough to pull it off. Although I found the rabbit boss' antics to be amusing, the other recurring gags ranged from the tepid (a loquacious old lady) to the cumbersome (Lucy's name) to the annoying (the constant and noisy intrusions of Toko, Taishi's younger sister). The jokes that do relate to the workplace are typically more awkward than funny, and those that might distract us from the fact that they all have such a boring job, such as the wordplay, are rarely ever funny enough to do so, and some, such as Hasebe's endless innuendos, are cringe-inducing. That aside, this series feels like something brought down by its own tentative nature, for while it shows promise at points it almost never drew laughter from me that was more vigorous than a chuckle. In that regard, it is a missed opportunity. Another major strike against Servant X Service is that its characters are a bit too well-adjusted for the intended style of humor, that of bouncing quirky personalities off one another, to be effective. While Lucy goes into convulsions over her name, she's otherwise just a bookworm, likable enough but not especially amusing to watch. Hasebe is just the guy who makes mildly inappropriate comments and pretends to be less competent than he is, his behavior being far more confusing than funny, while Megumi is the quiet one who secretly cosplays, Saya is the sweet, overly-polite girl, and Taishi is the kind and mild-mannered supervisor who gets bossed around by his loudmouthed sister Toko and taken advantage of by his coworkers. The pattern I am trying to point out is this: since this is neither a satirical show nor one based on slapstick, it must instead depend on the hilarity of character interaction to succeed, so it is thus bizarre that the characters should feel this mundane. Plenty of shows have an otaku character, for example, and Servant X Service doesn't really put in the effort to distinguish Megumi from them, nor does it do anything to surprise us in regards to its "nice and normal" characters. It's not that I especially disliked any of the cast (even Toko has her moments), but I couldn't get attached to any of them either: it feels like an array of "straight man" figures without their counterpart wacko characters. It doesn't help much that the show's attempted romantic angle between Hasebe and Lucy takes far, far, far too long to get anywhere, either, nor was quite enough time spent on this or the show's other "serious" elements to make up for the tentative humor. Servant X Service isn't terrible by any means, but it really isn't that funny, either. For all I know, this could easily be an instance of a good four-panel manga series not being effectively transcribed into 20-minute-episode form; I have not read the parent manga, and anyone reading this must bear that limit to my perspective in mind. Indeed, it's not as if this was a slapped-together rush job, for the art is attractive and the animation serviceable for this kind of show, even if the music, especially the cast-sung theme pieces, could have been much better. If a comedy doesn't make me laugh consistently, however, it has to provide something extra to carry me through. Servant X Service doesn't succeed on either front. Recommended Audience: The characters drink and get mildly intoxicated in one episode, while Hasebe frequently makes mildly lewd comments. This is probably fine for older kids and above if you don't think that mild drunkenness is inappropriate for them, but it is aimed at older audiences.